Large trucks are involved in fewer than 4% of all motor vehicle crashes. However, driver error is responsible for one-fourth of all truck accidents. When a truck is involved in an accident, it is three times more likely to be fatal, and nearly 80% of those killed in crashes with a large truck were the people in the other vehicle. More than two-thirds of the trucks involved in crashes are semi trucks. In general, truckers are the most experienced and safest drivers on the road, but when they make mistakes, it’s almost always the other driver that ends up suffering. The truck wreck lawyers at McWhirter, Bellinger & Associates can help if you or a loved one has been involved in an auto accident with an 18-wheeler or other large truck. With offices throughout South Carolina, we can work to help you receive the compensation you deserve. For a free case evaluation, call 888-353-5513 today. Truck accidents tend to be exceptionally complicated cases. It takes a skilled, experienced South Carolina truck accident lawyer to investigate your accident, determine its cause, apportion liability and then successfully pursue compensation on your behalf. Finding the cause of your truck accident is particularly difficult. There are usually many factors that go into producing a truck accident, and it requires hard work and determination to discover the truly at-fault party. That’s where McWhirter, Bellinger & Associates, P.A., come in. We have ample experience as truck accident lawyers, and we know what to look for when we investigate your truck accident. If you’re a South Carolina resident looking to speak with an experienced truck accident lawyer about your claim, please call McWhirter, Bellinger & Associates, P.A., today at 888-353-5513 for a free consultation. Because of the massive size of most commercial trucks, accidents involving them tend to cause significant injuries to innocent victims. Our South Carolina truck accident lawyers have helped many clients who have seen their lives dramatically affected by these accidents. Fatigued drivers: Many trucking companies set unrealistic schedules for their drivers. As a result, drivers often have to operate their vehicles for unsafe lengths of time without much sleep. This lessens his or her reaction time and puts everyone on the road in danger. Intoxicated drivers: Related to the fatigue issue, many drivers feel they have to resort to stimulants or other drugs in an effort to stay awake and alert. Drivers suffering the effects of intoxicants cause many truck accidents. Defective vehicles: Trucks with old, defective, poorly designed or poorly manufactured parts represent significant dangers on South Carolina’s highways. Cargo overloads: Many companies will load their trucks with too much cargo, thus making the vehicles unsafe and difficult to maneuver. This can make the trucks much more accident-prone. Distracted drivers: Our South Carolina truck accident lawyers have seen truck drivers distracted by GPS monitors, cell phones and even paperwork. Driving a truck is a task that requires a driver’s utmost attention. According to the Federal Motor Carrier Safety Administration, commercial truck accidents cause billions of dollars each year in damages. With all of this money on the line, it’s easy to understand why trucking companies immediately send their lawyers to the scene of a truck accident as soon as it occurs. The goal of these company representatives is to collect evidence, statements, and other information to protect the interests of the trucking company. To protect your own legal rights and interests, remember to take the following key steps after a truck accident. Before you do anything else, you need to seek out medical attention. When possible, on the scene of a truck accident you should contact 911. Even if your accident seems minor, which is rarely the case with truck accidents, you want it documented by police. Everyone involved in the accident should be examined by emergency personnel, regardless of whether or not they seem to have serious injuries. Some injuries, such as whiplash and traumatic brain injury, don’t show obvious symptoms until days after the accident. Follow up your emergency exam with a more thorough examination by your personal doctor once you have left the scene of the accident, and obtain copies of both examination reports as evidence. Pictures are incredibly valuable evidence if you choose to pursue a personal injury case. Include skid marks, truck damage, damage to your own vehicle, and any environmental factors that may have contributed to the accident. Be sure to include pictures showing the condition of the truck’s tires if possible. Finally, you should contact a truck accident attorney as soon as possible, and before you give any information to the other driver’s insurance company. If you are seriously injured, pursuing a truck accident case on your own can be incredibly difficult—especially when you are up against large trucking companies and their lawyers. While you focus on recovering, a lawyer can answer questions about your truck accident, investigate your accident, collect and preserve important evidence, and build the strongest possible case on your behalf. 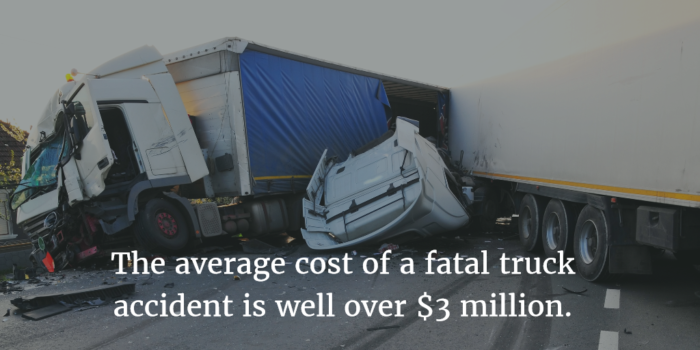 Don’t take chances on your truck accident case; make sure you are pursuing the compensation you deserve. We depend on truckers for all the goods we buy, from our daily bread to the books we read at bedtime. Over 88% of all goods shipped in this country travel by truck, traveling on average 178 miles from factory to warehouse, warehouse to warehouse, or warehouse to store. 178 miles when these truckers share the road with you and your family. To minimize the crashes involving large trucks, the FMCSA has established a comprehensive set of statutes governing the training and monitoring of commercial truck drivers on the roads and the maintenance of the trucks. South Carolina has added additional rules to improve the level of safety. However, these rules cut into the profits of the trucking companies and their drivers, giving them incentive to break the rules, which may explain why the number of fatalities suffered in trucking accidents each year has remained roughly constant for the last decade or more. Trucking companies can also change the laws through lobbyists and political spending, which can influence the state and federal governments to pass laws in trucking companies’ favor. The FMCSA has constantly adjusted its rules to allow drivers to spend more time on the road with less time off. Even though appeals courts have ruled that the guidelines are unnecessarily dangerous, the FMCSA keeps re-instituting the same rules, allowing trucking companies to force dangerously tired truckers to stay on the road. The South Carolina code of laws requires that vehicles not be operated when overloaded, and the code allows officers finding overweight trucks to keep the truck from moving until it has been unloaded. However, this is rarely done. Instead, it’s common for overweight trucks to be allowed back on the road after paying a small fine. This generates revenue for the state, and lets truckers keep their schedules, but puts drivers like you at risk. Truck accident cases can involve many complex factors, including identifying the source of the accident. Because of the various people in charge of loading, unloading, and maintaining a truck for hire, the liability situation could be very complex, much more than an auto accident. Our experienced attorneys know how to handle the complexities of these types of cases and are experienced in determining the party liable for the truck crash. Designers of tractor-trailers: The design of the actual truck may be flawed or defective, making the truck an unsafe vehicle to operate. Manufacturers of truck parts: A defect can arise in the process of manufacturing important mechanical or electrical components. These defects can be the cause of an accident. Truck drivers: If a truck driver is careless, distracted, driving intoxicated or violating hours-of-service regulations, then the driver may be the reason the accident happened. Truck owners: The practices enforced by truck owners may have been responsible for the maintenance or driving issues that caused your crash. Freight owners: If the driver or trucking company was not given important information about the cargo, it could affect the truck’s handling and cause a crash. Trucking companies: The company responsible for hiring, training, and supervising truck drivers may be held responsible for the accident if their negligent practices led to a poorly trained driver or a driver who has been instructed to drive beyond hours-of-service regulations. Loading companies: The cargo of a truck must be properly loaded, balanced, and secured, otherwise the cargo could shift, fall, or tip over the truck, resulting in an accident. Shipping companies: The company responsible for shipping the cargo may be found to be at fault. Designers and maintainers of defective roads: The road itself can be poorly designed and maintained, causing unsafe conditions that result in a truck accident. South Carolina law follows a common law doctrine of joint and several liability, meaning that all parties are liable for the full amount of the award if any of the parties is unable to pay. In addition, the court’s policy of comparative negligence means that you may be eligible for a settlement even if you are partly to blame for the accident. When you get in an accident, you are unlikely to be able to immediately identify who is responsible for the accident or even exactly how it was caused. Because these things are not easily recognized, it is important for you to not admit fault, apologize or speculate about the cause of the accident when answering questions from police officers responding to the scene. Answer their questions honestly and fully, but avoid talking about what you think caused the accident if it will make you appear at fault. If you believe someone else is responsible for causing the truck accident that injured you, then you deserve maximum compensation for your injuries, lost wages, medical bills and other outcomes of the crash. Trucking companies have powerful insurance companies, so it is important to get an experienced attorney who can identify the cause of the accident and represent your case. If the accident was not your fault, you shouldn’t necessarily accept the insurance company’s settlement offer. First talk with our attorneys about your legal options. You may deserve a much greater amount than you are being offered. Commercial trucking operations are subject to certain laws and regulations. If a truck causes serious injury in a crash, especially as a result of violating these laws and regulations, the responsible party should be held accountable for any accidents and resulting injuries caused by the overweight truck. Attorneys at McWhirter, Bellinger & Associates have handled many different types of truck accident cases, giving us the experience to take your case. If you or a loved one has been injured in an accident, or you lost a loved one in an accident, please contact McWhirter, Bellinger & Associates at 888-353-5513 to schedule a free consultation with an experienced truck accident attorney. We have locations in South Carolina near Camden, Sumter, Lexington, Aiken, Columbia, Orangeburg, and Newberry. The experienced South Carolina truck accident attorneys at McWhirter, Bellinger, & Associates, P.A., will conduct an investigation into your accident to determine its cause and hold all negligent parties responsible. Truck accidents often involve multiple parties, all with insurance companies and attorneys fighting to minimize your settlement. Liable parties in a truck accident can include the driver, the company he works for, the company that loaded the trailer, mechanics, parts manufacturers, and even government entities. With so many potentially liable parties, the only way to ensure you are treated fairly is with an aggressive truck accident attorney on your side. If your injuries prohibit action on the scene of the accident, our truck accident attorneys will do everything possible to gather information for your case. Make sure you do not admit fault to anyone you speak with following your accident. If I am partly at fault for an accident involving a truck, can I still sue for damages? Comparative negligence law in South Carolina allows compensation to a victim in proportion to your contribution to the accident as long as your contribution to the cause of the truck accident is less than 50%. Often, cases are settled during negotiations and a lawsuit is not necessary. What are acts of God? Acts of God are events that are of natural origin and were not foreseeable or preventable by a driver. There are no responsible parties for an act of God. However, there may be contributing factors, such as negligence in maintaining a piece of property that became involved in the accident and contributed to the damages. How do acts of God affect my claim? Despite the extreme natural event that appears to have caused the accident and resulting damage, if any aspect of the damage could have been prevented by proper maintenance of any factor contributing to the accident, that contribution would be considered negligence. Indirect, contributing factors are those that are foreseeable and preventable. If truckers are the safest drivers on the road, why are they involved in so many accidents that they could have prevented? Some of the factors contributing to a truck accident are a combination of the trucker stretching the rules (e.g., carrying excessive weight) and authorities not enforcing the rules. Some truckers falsify their logs and drive more hours than are allowed by law. Others don’t heed warning signs (e.g., feeling sleepy, bad weather) and continue driving in an effort to meet a deadline or pick up an extra run. Do I have to sue in the state where the trucker lives or where his employer is based? Neither, unless they are in the state where the accident took place. If the accident took place in South Carolina, the lawyers of McWhirter, Bellinger & Associates, P.A., can help. With experience in truck accident claims, we can guide you through the maze of laws and procedures to help you receive compensation for your injuries, damages, and losses. Do I really need a truck accident attorney? 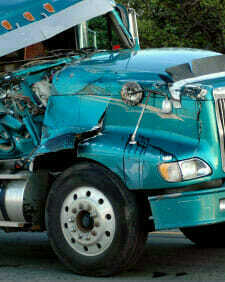 Truck accidents are complex and can include a number of liable parties. The only way to ensure you are treated fairly and provided full compensation is with the help of a truck accident attorney. You deserve someone on your side who will do whatever is necessary to help you recover. The truck accident attorneys at our firm are prepared to take your case and fight for your rights. If you have questions about your truck accident, please contact McWhirter, Bellinger & Associates, P.A., to schedule a free consultation today. Contact us through this website, or call 888-353-5513. We help victims of truck accidents throughout South Carolina from our offices in Camden, Columbia, Lexington, Sumter, Orangeburg, Aiken, and Newberry. With offices in Aiken, Camden, Columbia, Lexington, Newberry, Orangeburg, and Sumter, South Carolina, our personal injury lawyers are ready to serve you. For immediate help, call today at 888-353-5513.